I made some more cool visualizations with Microsoft’s Power BI technology that shows there’s more than meets than eye when evaluating which country is dominating. 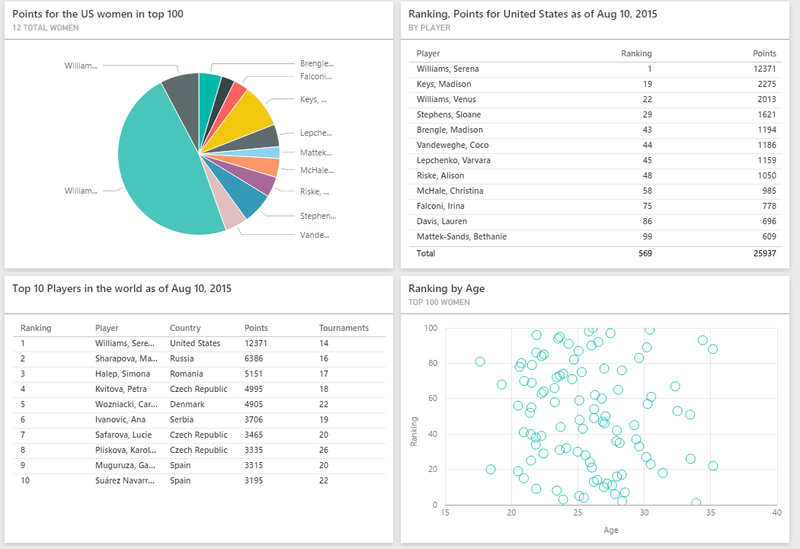 If you really look at it, Serena has earned almost half the points for all the United States! Check out the pie chart below. She has really dominated the past year, winning all the grand slams, giving her 8000 points. The 2nd ranked player in the world, Maria Sharapova, has 6000 points less than Serena. That’s a huge gap! I have been following tennis for almost 15 years and can’t recall seeing a gap that big (it’s possible, though, haven’t done my research). Without her, the US would not be nearly as dominating. Madison Keys is the second ranked American and is 19th in the world. But, of course, tennis is an individual sport so it’s not really about countries dominating, but it is nice to see lots of athletes from your neck of the woods. This analysis also shows how really important the grand slams are- you get some major points. Players like Serena are occasionally accused of not putting a lot of effort into the smaller events since they don’t matter as much for both points and money. I think that’s natural- motivation and incentives are key in all areas of life. It’s interesting to see the scatter plot showing what rankings player have based on age. The older players don’t necessarily have better rankings than younger players. It seems pretty even across the board.